Written by: Jessica Greenlee on October 9, 2013. With issue #5, Jirni Vol. 1 ends as it began, as a book that I would like to love but end up arguing with as much as reading. It’s still as unapologetic ally, unabashedly, and unalterably pulp as ever, and Ara’s costume is, if anything scantier than it was when the volume began. In the last issue, Ara found herself dealing with a treacherous thief. Here, she finishes dealing with him and moves on to the important matter: finding her mother. Unfortunately, Luna has already been re-enslaved and Torinthal is a capable and experienced villain more than ready to clear former allies out of the way and to send both his captive djiin out to battle Ara. There is a lot I like about Ara as she goes on her quest: She is determined, she can be ruthless when she needs to be, and she doesn’t waste time dithering or regretting past choices: She sees what is needed and does it. She’s also a capable fighter, a loyal daughter, and someone capable of taking time from her own quest to help others in need. She’s every bit as powerful as John Carter battling his way across Barsoom, a determined warrior with unexpected skills, though I must admit I miss Carter’s ability to find allies in unexpected places. Ara’s pretty much a loner, having left Nyalese behind with her kin as soon as possible, and the thief turned out to be a non-starter. The coloring remains one of the primary attractions to the volume. Hartman and Smith’s work continues to enhance the sense of far-away places. Also, there is a fantastic map at the end there that is almost enough to sell the volume on its own, and I like Reed’s lettering more with each issue. On the other hand, there is Ara’s costume-skirt-thong-thing, which is, I think even shorter than back when I was complaining about it in the first issue. Take a look at that cover up there and let me know. 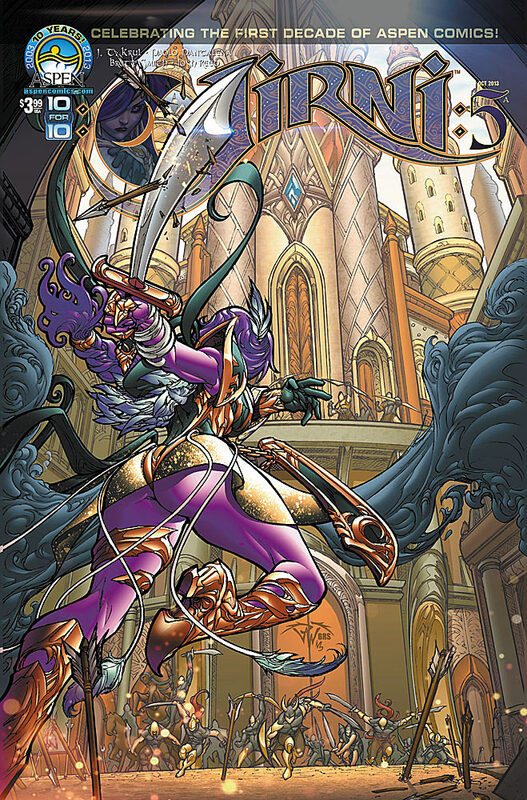 As with issue #1, the angles and image focuses throughout the book continue to emphasize not Ara’s fighting ability but the fact that her breasts are so big she ought to fall flat every time she tries one of those acrobatic leaps. And, don’t get me started on the weirdness of a romance between an enslaved djiin (Ara’s mother) and the man she watched grow up from babyhood. No, really. Don’t. If I get started on the power dynamics there I won’t stop. Overall, Jirni #5 pretty much lives up, and down, to all of the promises made in Jirni #1. If you liked #1, I see no reason for you not to enjoy #5. If you think Ara should have stopped for a wardrobe change before setting out on her quest, you’re going to be left wondering why she didn’t pick up a pair of pants and some boots while exploring the palace maze in search of her mother. What do you think of Ara’s Jirni ? Love it? Hate it? Want more? Ready to call it a day? My reviews of Jirni #1 and Jirni #2.